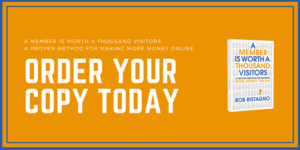 This spring I’ll be publishing a new book entitled A Member Is Worth a Thousand Visitors: A Proven Method For Making More Money Online. The book is anchored by a discussion of the five forces of online revenue growth through memberships. My team and I identified these forces over the past two and a half years through hands-on experiments with our clients, primary research and interviews, and a review of research projects done by academics. We’ve seen our approach drive 50-600% revenue growth. We’re previewing each of these forces to give you a taste of what the book can do to transform your business. To start from the beginning, read Force #1, Force #2, Force #3, and Force #4. My team recently analyzed hundreds of niche media companies and calculated how much money publishers are leaving on the table in terms of digital opportunity. The figure we arrived at exceeds the jackpot of any lottery in history. Businesses are leaving over $2 billion per year on the table. I’ve asked many clients why this is happening. Almost unanimously, they answer with some variation of, “We just don’t have the time/money/know-how to launch a better digital platform successfully.” My response would be that in today’s environment, between software tools, freelancers, employees, agencies, and consultants, you can find the resources. The first four forces of online revenue growth—whales, conversions, upselling, and analytics—focus on who to sell to and how to sell to them. Finally, the fifth force focuses on how to bring it all together with the right level of support. Let’s talk about three ways you can create bandwidth to launch your new-and-improved online revenue growth strategy. In the same way you might prune the dead branches away from a tree to make room for new and healthy growth, you need to prune your workflows by eliminating tasks and processes that do not contribute meaningfully to the success of your business. In fact, in my experience, it’s possible for most businesses to eliminate as much as 20 percent of what they do to free up their resources so that they can work on new ideas. Look at your workload and ask yourself if you are maximizing the use of your time and your assets. Where are you spending time wastefully with unnecessary work? It’s not enough to simply ask these questions and speculate on the answers. Perform an audit of your entire team’s outputs to see whether their activities are contributing to your bottom line. From your audits, you’ll know what you need to change or eliminate. But it’s important to get everyone on board. Pruning isn’t an opportunity to cut people necessarily. (Though unfortunately, from time to time an audit can reveal that you don’t have the right person matched with a certain position.) It’s an opportunity to cut superfluous activities to optimize their roles. Say you have a team member whose job can be almost exclusively automated using a certain tool. Why not make use of the tool and assign your team member a key part of a new initiative instead? Hiring full-time employees can create bandwidth, and this is a long-term solution. But I caution you against rushing to hire people. I recommend bringing people in-house only after you’ve gotten set up and have a proven business model. Why? It’s expensive, and it takes a lot of time and commitment. As you probably already know, there are quite a few hidden costs to hiring a full-time employee. In addition to their salary, you have to consider onboarding and training, office space and equipment, your tax obligation, and other parts of their compensation package like benefits and paid time off. And at the end of all of that, new hires can have a short shelf life. The average tenure for a millennial employee is just over one year. So before hiring anyone full-time, make sure you have a proven business model that can support the expense. For publishers operating on a tight budget and looking to try out a variety of new ideas, it’s better to hire external partners for specific projects rather than bringing people onto your staff full-time. Do you find that you have growth ideas, but your ability to implement them is limited by budget and time? Why not find a trusted partner who can help you step away from the day-to-day and launch new initiatives? You can bring successful initiatives in-house once they are proven. And you can avoid expensive investments in experiments that may or may not work out. Working with a freelancer, consultant, or another outside partner for specific projects allows you to innovate and experiment on a low budget with limited risk. It also allows you to tap into experts who would be too expensive to hire on a full-time basis. You may not have the sort of structure to support a full-time graphic designer, but contracting one to design a large ebook to serve as your initial email capture could certainly be a worthwhile investment. Ask colleagues for word-of-mouth recommendations or look for thought leaders in their industry. Focus on finding someone with a strong business acumen who has the soft skills you’re looking for. If you follow these three tactics, you can undoubtedly create bandwidth to generate necessary growth to your revenue streams. And with a robust strategy built on these five forces, you can efficiently make smart, calculated decisions that serve your customers’ better and meet their needs, boosting your own bottom line in the process. For more advice on how to eliminate unnecessary work and recruit new members for your team, plus detailed strategic advice on all five forces of online revenue growth, order your copy of the book: A Member Is Worth a Thousand Visitors: A Proven Method For Making More Money Online. Rob Ristagno, Founder and CEO of Sterling Woods, previously served as a senior executive at several digital media and e-commerce businesses, including as COO of America’s Test Kitchen. He started his career as a consultant at McKinsey. Ristagno holds degrees from the Harvard Business School and Dartmouth College and has taught at both Harvard and Boston College. Rob is the author of A Member is Worth a Thousand Visitors: A Proven Method for Making More Money Online, set to be published in 2018. He regularly speaks at key media conferences, including at Niche Media events, Specialized Information Publishers Association meetings, and the Business Information and Media Summit.